We all love to celebrate the season with tons of holiday parties, lunches and get-togethers. It doesn’t take much for these fun times to turn into a dietary disaster! 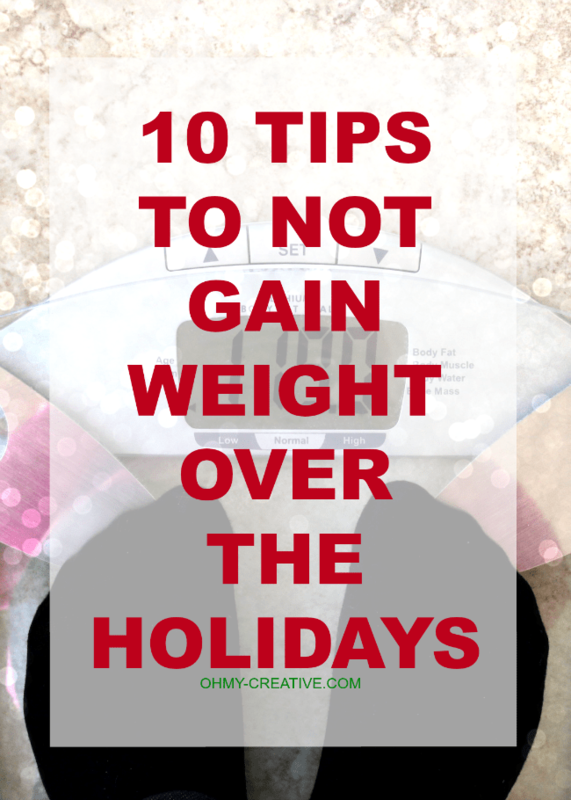 I need these 10 Tips To Not Gain Weight Over The Holidays! I just finished attending four parties in four days, and I can tell you I didn’t feel great about the things that I was eating and drinking. Unfortunately, there are rarely healthy choices served at these types of events! I decided to ask a longtime friend and personal trainer, Karen, to give me a little help! She came up with these 10 Tips To Not Gain Weight Over The Holidays! I thought I would share them since we can all use a little guidance to stay on track and be healthy. I hope that you will find these tips useful to keep the calories low and feel good this time of year! Leave me a comment and let me know what your favorite tip is to not overdo it at the holidays! #1: Eat a sensible meal before the party. You should always arrive at parties with a full stomach. I realize that this goes against the popular trend of starving yourself before a party, and that’s exactly why most people gain weight. Since your stomach will be full, you’ll have the clarity to pick and choose the treats that you really want, rather than stuffing yourself with everything in sight. #2: Bring a healthy dish to share. Don’t worry if the party that you’re going to isn’t a potluck – the hostess will love you for being so thoughtful, and you’ll have a healthy option to enjoy. #3: Never drink calories. Alcoholic beverages and sweet holiday drinks are simply packed with calories. These calories don’t take up much room in your stomach so you’re left wide open for even more calories. #4: Fill your plate, but only once. That’s right, you heard me. No going back for seconds. Since you’ve already eaten a sensible meal before arriving, this rule is going to be easier to keep than you think. #5: Taste dessert, just a taste. The holidays are all about sweet treats, so go ahead and partake. But just a taste. Look at desserts as something to savor, not something to fill up on. #6: Drink plain coffee instead of a sweetened holiday coffee drink. Drop 250 calories (or more) when you stick with plain coffee or tea instead of sugar-filled holiday coffee drinks. #7: Stick With Fruit. It’s amazing how satisfyingly sweet fruit is – it’s truly nature’s candy. #8: Steer Clear Of Saboteurs. The sad truth is that people in your life will try to sabotage your low sugar diet. The best avoidance strategy is to sincerely thank the sugar-pusher for their gift, tell them you wish you could eat it, and then blame me – your trainer – as the bad guy who says that you need to cut back on sugar. #9: Eat More Protein. A diet rich in protein keeps you full, satisfied and less likely to crave sweets. #10: Workout Like You Mean It. A regular, challenging exercise routine will not only get you into amazing shape, it also reduces your cravings for sugar. The endorphin rush brought on by vigorous exercise is an even more powerful feel-good-feeling than the pleasure gotten by indulging in sugary foods. Make challenging, consistent exercise a part of your life by signing up for one of my fitness programs. I’d love to get you to your goals using my results-driven method. I have face-to-face studio training if you live near Gibsonia, PA. And I have Online Exercise and Nutrition programs if you don’t. Check out the different types of training programs that are available here: Studio Training. Online Training. And don’t forget to sign up for your FREE GetFit newsletter from Hitek Training! It’s full of tips on exercise and nutrition that will help keep you motivated and on track! Follow me on facebook for more tips and healthy recipes! Linking to these wonderful parties! Hi, I’m Susan! Thanks for stopping by Oh My! Creative. I like to have fun, make fun things…you know, create stuff! I love DIY, decorating and design and like any girl…shopping and lunch!